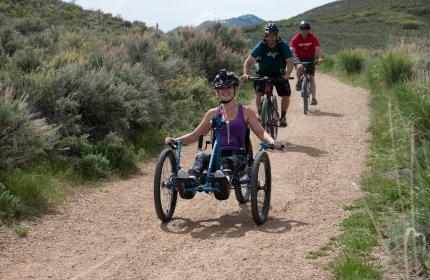 There are many factors that contribute to Park City, Utah’s uniqueness, including its people. The My Town series highlights a variety of individuals who have made Park City their home. Meet Laurel Bartmess, owner of Woodland Biscuit Company, and learn how she created a peaceful escape where the focus is high-quality, local foods and homemade biscuits. Meet Bridgette Meinhold, a local artist, who finds inspiration in the area's natural beauty and translates it into encaustic paintings. Meet Lindsay Cunningham and Whitney Kozlowski, co-founders of The Beau Collective -- a unique blend of fitness, social gathering, motivation, and community. Meet Anna Davies and Robbie Stout, co-founders of Ritual Chocolate, and learn how their dreams of producing single-origin, craft chocolate became reality here in Park City. Meet Charlie Sturgis, Executive Director of Mountain Trails Foundation and learn how he has helped build, maintain, and protect Park City's trails. Meet Brent Whitford and Brad Hart, co-founders of Red Bicycle Breadworks. Red Bicycle has produced hand-crafted artisan bread, using the finest local ingredients, since 2007. Meet Jason Morgan and Stephen MacKay, co-founders of Old Town Cellars -- "the Official Wine of Après." Explore how they strive to keep wine affordable, welcoming, and fun. Meet Greg Schirf, founder of Schirf Brewing Company -- makers of Wasatch Beers, and learn how his dreams impacted the future of Brew Pubs here in Park City. Meet Bryon Friedman, founder of Soul Poles, and learn about how he made his dreams of producing eco-friendly, bamboo ski poles a reality. Meet Brian Richards, Executive Director of Mountain Town Music and learn how he contributes to Park City's music scene. We invite you share your Park City experience with us! Tag your Instagram and Twitter posts with #VisitParkCity or upload your images here to be included in our gallery.